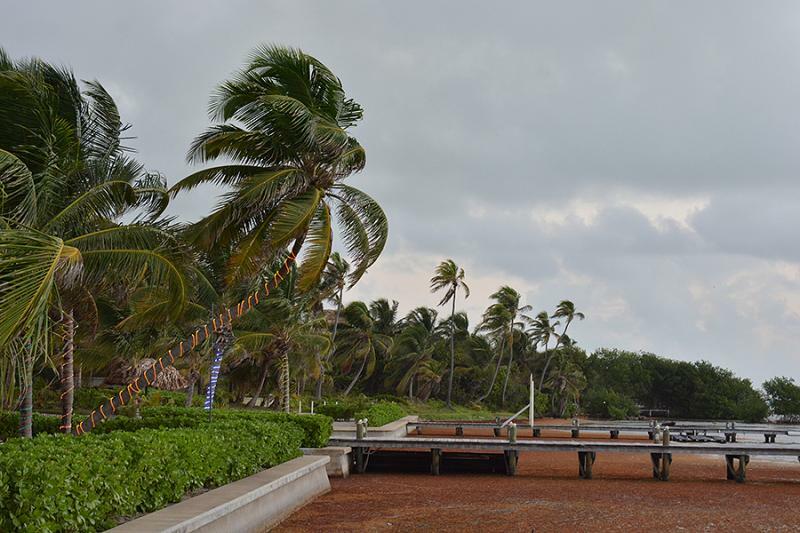 Belize NMS: Moisture will increase later today ahead of an approaching cold front. 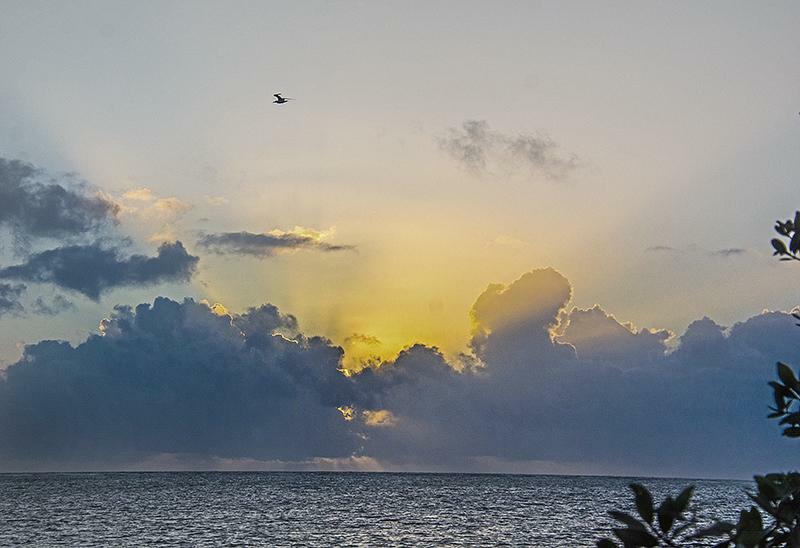 24-hour forecast: Sunny with a few cloudy spells this morning along with isolated showers. Cloudiness will increase later this afternoon with some showers and a few thunderstorms mainly inland at first and then spreading to most areas tonight. Mostly clear with little or no rainfall tonight. Sunny with cloudy spells tomorrow. Isolated showers tomorrow morning, then a few showers and thunderstorms mostly inland and north tomorrow afternoon and evening. Winds: East to southeast at 5-15 knots today...Increasing and shifting to the northwest early tomorrow. Today: Winds: E-SE 5-15 kt,; seas: Choppy. ; waves: 3-4 ft.; isolated showers. Tomorrow: Winds: N-NW 15-25 kt. ; seas: Rough. ; waves: 5-7 ft.; some showers and a few thunderstorms (south); periods of rain elsewhere. Marine Outlook: Wednesday night: Winds: N-NW 15-25 kt. ; seas: Rough. ; waves: 5-7 ft.; some showers and a few thunderstorms (south); periods of rain elsewhere. General Outlook: For Wednesday and Wednesday night is for cloudy, windy and cool weather. Some showers and a few thunderstorms will occur over the sea and in the south and periods of rain will occur elsewhere. The expected high today on Ambergris Caye is 87f. The sea is calm and our wind is from the ESE at 7 mph. Tomorrows predicted North wind will hopefully blow this Saragossa seaweed off shore. The early fog burnt off early this morning. . . .You might have noticed high clouds in the West.. . . . .There is also some moving up from the South, not much. . . .The Caribbean air still coming in from the ESE.. . . ...But that High level wet air is associated with a cold front. . . . .I am not yet seeing any effects close to Belize. I expect today will be mainly Sunny, but with a little bit more cloud than yesterday, still no rain in sight. Definitely more cloud around than yesterday . . . .That Pacific wet air is having some effect. But also the cold air from the States, is pushing in under that wet Pacific air, and is now having an effect on Belize weather. 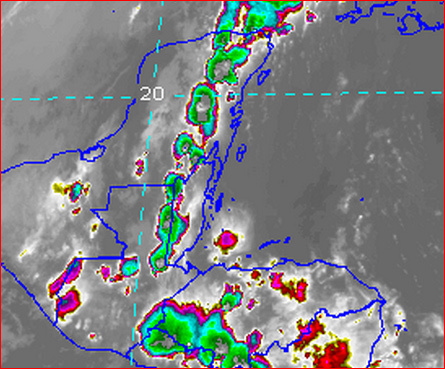 Some dark clouds around, and probably some rain I expect, but without the Radar, I don't know exactly where is being effected, I suspect mainly western Belize, but I suspect it will spread to much of Belize later today and tonight, with isolated patches of rain in places. I am hearing Thunder, which, under these circumstances, indicates two different air masses interacting. And seeing wind activity, which would indicate rain is not far away. 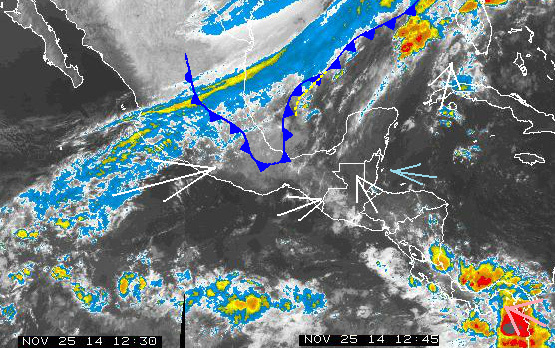 A Cold front is presently approaching Belize. The pre-frontal storm cells are moving from south to north. Not much rain associated with the front at the moment. Will see what this weather looks like in the morning. 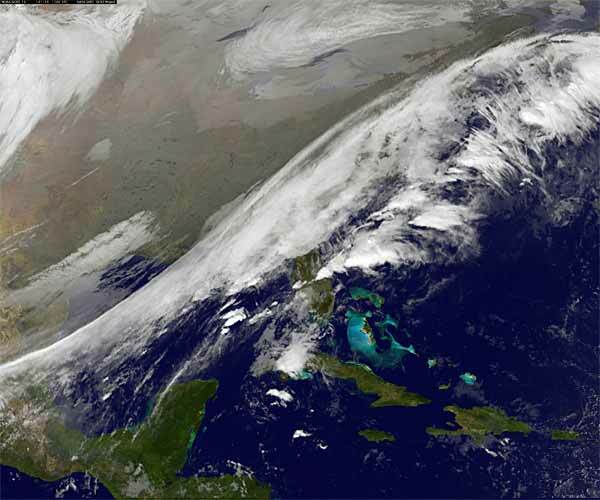 The main front is not supposed to arrive until tomorrow morning after sunrise.